It’s time for another edition of Thrift Store Finds. For awhile there, I was getting disappointed because there didn’t seem to be much out there for a few weeks. One weekend I visited all my usual thrift stores and a few garage sales and I couldn’t find one thing! However, that all changed last weekend – I hit the jackpot! The first stop was a local thrift store that’s open only on weekends. For about $10, I walked out with several pieces of vintage fabric, some vintage hand embroidered table linens, a spice rack, and two super cute vintage aprons! These embroidered toppers need some TLC, but after I wash and starch them, they should look pretty good. I was especially pleased with the red apron. 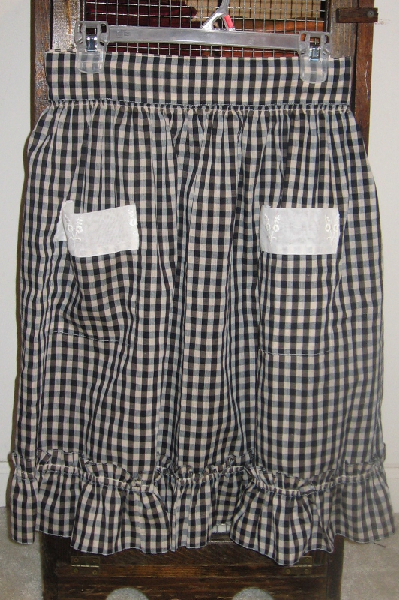 When I was little, my grandma’s main form of discipline when she was watching my brother and me was to say, “Don’t do that, or I will have to put on my red-checkered apron.” To this day, I have no idea what would happen if she actually put it on – but in my mind I envisioned her chasing me around the house with a rolling pin and swatting my bottom with it. Needless to say, my brother and I were always concerned when she said this and usually stopped whatever we were doing and snapped to attention. Of course, when I was little, I never actually saw this apron (although I certainly tried to find it). I remember asking my grandma one time where she kept it and she said it was hidden in the kitchen. Well, guess what? I found it! One other treasure I also was excited about was a hand-pieced quilt top. 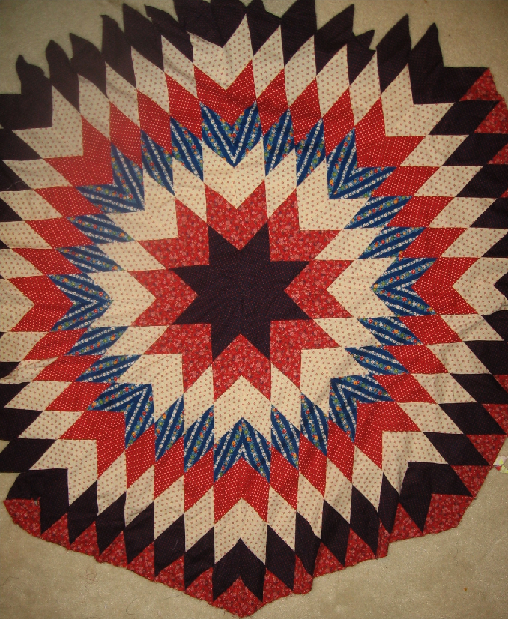 The piecing is almost complete, it just needs a few more diamonds added to the outside border. I plan to finish this and use it on my kitchen table. You can’t see it very well in the picture, but the fabrics are vintage and quite lovely. 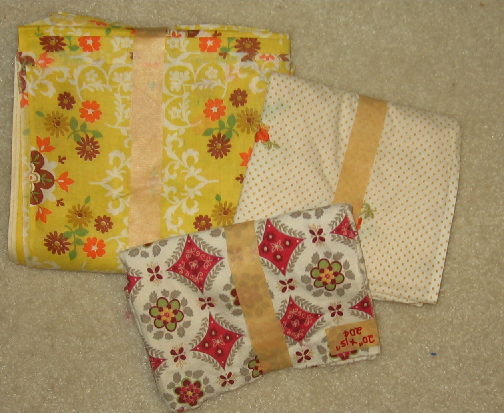 Luckily, the fabric scraps were also included, so I can finish it up with the original fabric. The next stop was a local yard sale. The owners were cleaning out the attic of all their children’s toys. They had tons of vintage board games and toys from the 60’s and 70’s for dirt cheap! 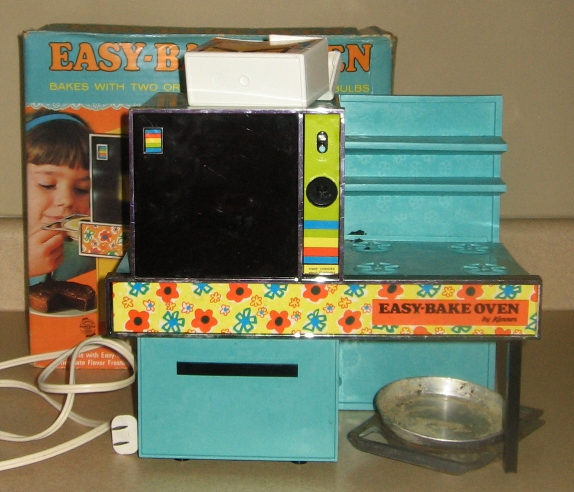 She even had an Easy Bake oven (with box!) 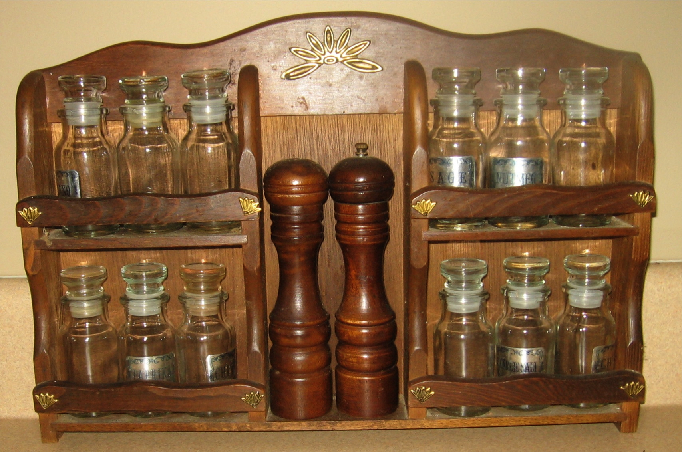 – which I thought would look cute displayed in my kitchen. The last deal of the day was this Kenmore Sewing machine. It’s about 10 years old, but hardly ever used. 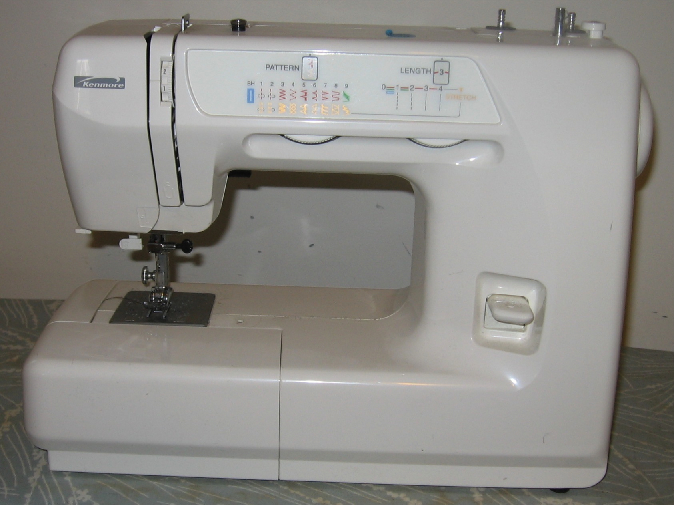 You can always use another basic sewing machine. Also, I’ve been kicking around the idea of doing offering sewing lessons and this would be great for teaching beginners. 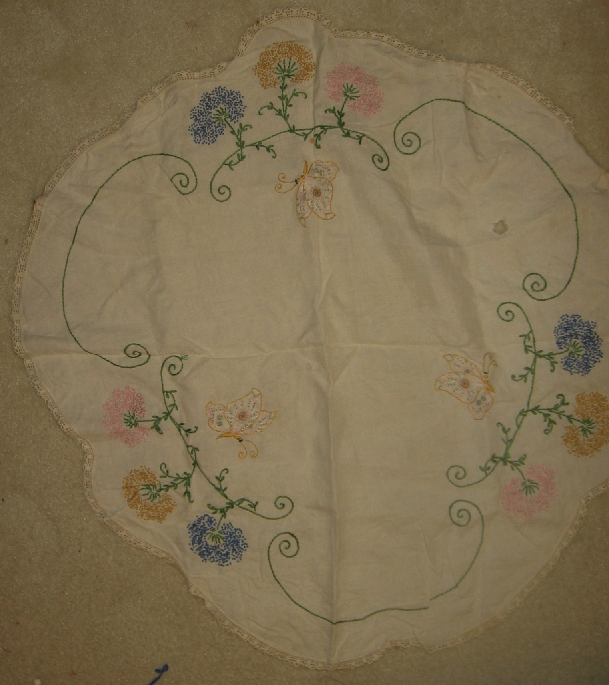 This entry was posted in Aprons, Fabric, Flea Market Finds, Quilting, Sewing, Vintage. Bookmark the permalink. A gold mine!!! Can I have the blue bird table topper??? Please, please, please!!!!!!! What do you have to offer in return 🙂 ? 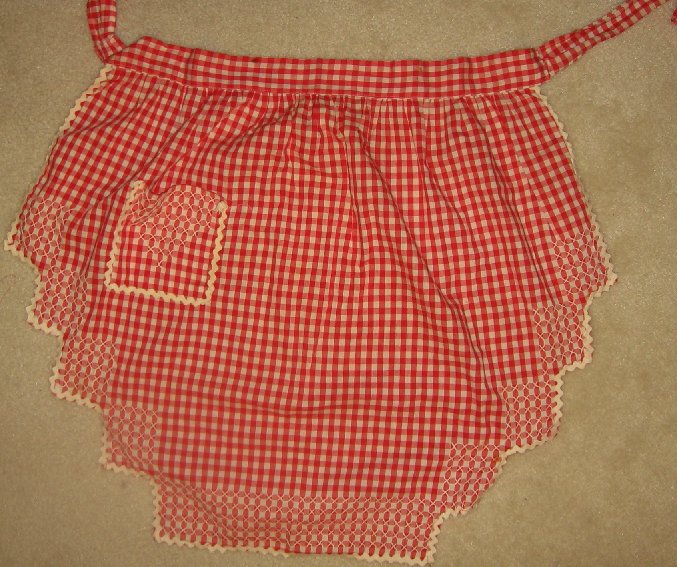 Of course Grandma never even had to think of her red checkered apron until the two of you came into the family. Uncle Richard never even came close to that threat. From what I understand about Uncle Richard’s behavior as a kid, he was beyond a red-checkered apron!!! 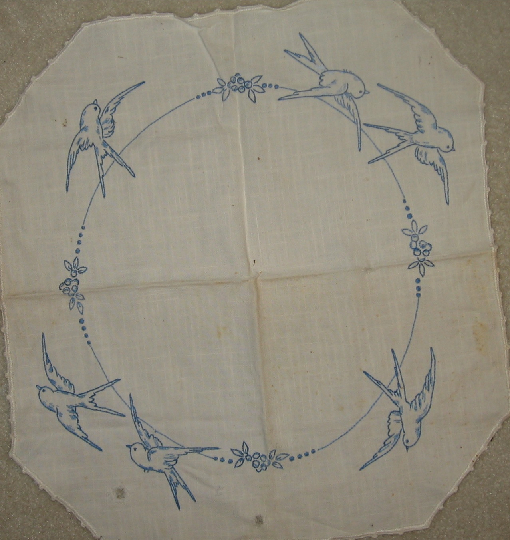 You found some great stuff – that quilt top is amazing!! Great post thanks for sharing. You have a great layout here. Quilting is something I really enjoy doing. It passes the time and is very relaxing.